The Alaska State Library is currently accepting applications for two internships in public libraries for the summer of 2019. Interns will receive travel reimbursement, per diem ($60/day for 50 days), a honorarium and free housing during the eight-week internship. 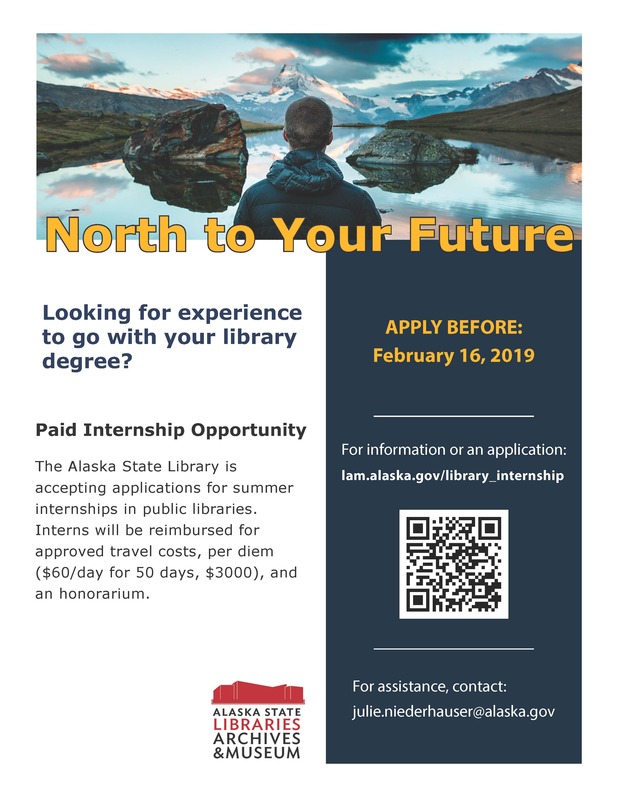 The Alaska State Library Internship Project is a grant funded project that will bring two interns who have recently received or are near completion of their Master’s degree in Library or Information Science to work in Alaska public libraries for two months in the summer of 2019. The goals of the project are to provide assistance to public libraries in Alaska who lack staff expertise to sustain long-term projects that would benefit their libraries and communities, provide internship and professional development opportunities to MLIS graduates, and increase the number of MLIS graduates applying for jobs in Alaska. Application period will close February 16, 2019. The UAA/APU Consortium Library is recruiting for its Reference Services part-time labor pool. These positions work at the Reference Desk, a combination of evening, weekend, and day hours, and will participate in departmental project work. More information can be found at the links below. Note that there are two job ads. Please note that reviews of applications will begin as they are received. Feel free to forward on to those you think may be interested. Contact Page Brannon at plbrannon@alaska.edu with any questions. The University of Alaska Southeast Egan Library is hiring for a full time Library Technician 2 position to work on their Technical Services team. Job ad below! Please pass along to anyone you think might be interested. Initial review date is August 6th. Are you looking to get your foot in the door at an academic library? Want a paraprofessional position with a variety of job duties? This full time (40 hours per week) position is part of the Technical Services team, and is the lead for library serials and collections repair work. Typical serials duties include daily receipt of periodicals; check-in using library software; maintenance of subscription records; and shelving. Ongoing work includes verification of online access to electronic serials; working with the physical collection by ensuring that materials are properly housed in bindings or cases to promote their long-term preservation; and performing book repairs including paper and binding repairs. This position works independently but also collaborates closely with the rest of the library team, assisting at the Circulation Desk, and cross-training with the Interlibrary Loan and Outreach Services assistant. This position is open until filled, with an initial review date of August 6th, 2018. Electronic Resources Management (20%) Tracks coverage of electronic resources through online tools including the library catalog, OCLC Worldcat, and JournalSearch. Sets up new resources by working with vendors and library tech support to make sure on- and off -campus authentication is working and that access includes all content to which the library is subscribed. Gathers usage data from in-house tools including JournalSearch, the library catalog, in-house serials use statistics, and external vendor reporting modules. Compiles data and reports to Technical Services Librarian as requested. Tracks institutional account information including usernames and passwords for publisher sites. Shares authentication and access information with staff as needed, and maintains security of these assets as appropriate. Collection Maintenance (25%) Evaluates materials sent to department for repair. Applies knowledge of different repair techniques to select most appropriate method for the item in hand. Using specialized knowledge and tools, conducts paper and binding repairs. Serves as the library point person on book repair, answering questions from other library staff and members of the university community. Reviews labels and records for processed materials, ensuring information is correct for patron and staff use. Performs end processing for all formats including creating and preparing pamphlet binders, comb bindings, cases, and special labels. Maintains awareness of special processing requirements such as use of identifying stamps for depository materials and bookplates for endowment fund purchases. Ensures that requirements are met. Creates lists of withdrawn materials for offering on the Alaska Library Association email list, responds to libraries, and coordinates distribution of materials. Public and Outreach Services Support (25%) In coordination with Circulation Supervisor, assists with projects at Circulation (reserves, weeding, checkout equipment ) and occasional staffing of the desk during lunch breaks or around unexpected scheduling challenges. Works closely with the Interlibrary Loan and Outreach Services assistant, covering absences, coordinating on work with serials, electronic resources, interlibrary loan, and the institutional repository, cross-training as needed. Serials (25%) Process incoming serials and periodicals (newspapers, magazines, journals, books on standing order), checking-in items using Sirsi Workflows software, and labeling and shelving items as appropriate. Tracks retention policies; withdraws and discards materials according to retention schedule and local procedures. Uses the Sirsi Workflows Serials Control module to track issues received and expected. Uses prediction patterns in the module to generate list of expected issues. Maintains historical notes about library subscription activity in the module. Working with Acquisitions and Catalog assistant, creates summary holdings records in the library catalog and OCLC WorldCat using MARC holdings format, following national standards and data entry conventions required by OCLC. Ensures all information is accurately displayed for patrons using the library catalog. Communicates with vendors (subscription agents, journal and microfilm publishers, book vendors, bindery, shipping agents, etc. ), making inquiries, placing orders, and filing claims. Respond to patron and staff queries about serials. Participates in team meetings and work within Technical Services department. Maintains knowledge of functions in the Technical Services department and cross-trains in other areas as necessary. Participates in discussions regarding integrated library system (ILS) capabilities and current procedures both within Egan Library and in relation to Alaska Library Consortium, especially as relating to serials and electronic resources. Mail & Bindery (5%) Receives and routes incoming library mail (periodicals, standing orders, interlibrary loans, catalogs, etc.) Prepares all outgoing shipments of materials from the TS department, including sending withdrawn materials to other libraries and Friends of the Juneau Public Libraries bookstore. Plans, schedules, and processes items to be sent to the bindery and shelves the volumes when they are returned (twice a year). Prepares all paperwork for bindery including work slips, USPS insurance documentation, and list of titles sent for posting at Reference Desk. Prepares boxes for shipment. One to two years post-secondary education including coursework in Archives or Library practice and theory, OR an equivalent combination of training and experience in a library, museum, business or comparable environment. Without previous experience with library systems expect 3-6 months on-job training to be functioning efficiently; less than that if comes with book repair and/or ILS experience and is familiar with bibliographic records, call numbers, etc. Ability to pay close attention to details and to read, interpret, and accurately enter precise data involving numbers, characters, dates, barcodes, etc. Ability to copy and transcribe written information accurately. Knowledge of databases, spreadsheets, and data entry. Ability to work with library equipment and tools to perform book repairs and basic bindery. Ability to physically process collections including shelving. Ability to work independently; ability to work as part of a team. Ability to write clearly and document procedures. Experience working with computers and software applications in a work/office environment. Physically able to lift or move moderately heavy boxes of books and move book trucks at least 3/4 full of books, magazines, etc., with or without reasonable accommodations. This is a full-time, Grade 75, 12-month position complete with a competitive salary and UA employee benefits package. This is an open until filled recruitment with the initial application review taking place on August 6th, 2018. As a public, regional, comprehensive university, UAS is committed to building a culturally diverse and inclusive organization and strongly encourages women, minorities, individuals with disabilities, and veterans to apply. All interested persons should apply online. For further assistance with the application process contact Human Resources at 907-796-6263. We’d like to invite everyone to attend the next Alaska Library Association – Anchorage Chapter (AKLA-A) meeting on Monday, April 2nd, at 6:30 pm. We’ll be discussing the recent AkLA conference that took place in Anchorage, and we’ll hear from AkLA-A’s conference attendance award winner, Sam Dinges (go, Sam! ), about his conference experience. Where and when: Table 6 (3210 Denali St, Anchorage, AK 99503) on Monday, April 2, at 6:30 PM. The Alaska State Library is accepting applications for three summer internships in public libraries. Interns will receive travel reimbursement, a $4,000 stipend and free housing during the eight-week internship. The grant-funded Alaska State Library Internship Project will bring three interns who have recently or are near completion of their Master’s degree in Library or Information Science to work in Alaska public libraries for two months in the summer of 2018. The goals of the project are to provide assistance to public libraries in Alaska who lack staff expertise to sustain long-term projects that would benefit their libraries and communities, provide internship and professional development opportunities to MLIS students and increase the number of MLIS students applying for jobs in Alaska. Application period will close February 15, 2018. Please join us for a joint AkLA-A/FLIP meeting at Moose’s Tooth on Tuesday, November 14th, at 7 pm. At this month’s meeting, we’ll be giving updates on planning for the 2018 AkLA conference, discussing the possibility of offering an AkLA-A conference scholarship, and eating some good pizza. MLS (or potential MLS) students are encouraged to attend this informal networking get-together. Feel free to invite anyone who might be interested in the field of library and information science. Are you interested in attending the 2018 American Library Association’s Annual Conference in New Orleans, LA? Apply for the New Members Round Table Shirley Olofson Memorial Award and you may receive a $1000 check to help defray the cost of attendance! The deadline is Wednesday, December 14, 2017. To apply, please visit: http://www.ala.org/nmrt/initiatives/applyforfunds/shirleyolofson. The AkLA Scholarship is awarded annually to an Alaska resident who is pursuing an MLS in an ALA-accredited Program. For more than twenty-five years the Alaska Library Association has been offering scholarships to MLS students in order to provide financial assistance to worthy students pursuing graduate studies leading to a Master’s Degree in Library and Information Studies and to encourage graduates to return to Alaska and work in professional library positions. Scholarships may be awarded for both on-campus and/or distance education programs. Preference will be given to an individual meeting the federal definition of Alaska Native ethnicity. is eligible for acceptance, is currently enrolled, or will be a student in a graduate school library media specialist certificate program during the academic year, semester, or academic quarter for which the scholarship is received. makes a commitment to work in an Alaska library for a minimum of one year after graduation as a paid employee or a volunteer, or for two semesters for one semester’s financial assistance. A scholarship recipient who fails to fulfill this commitment will be expected to repay the money received. Candidates awarded the scholarship must supply proof of admission to an accredited program before the scholarship is disbursed. Strength of references. Three Applicant Reference Evaluation Forms are required, at least one of which must be from a librarian. References may include additional comments or letters. Please note new application procedures! Fill out the online form, and then mail a current resume, official college transcripts, and three references using this printable Word form, to AkLA Scholarship Committee, Att: Julie M. Niederhauser, Alaska State Library, 395 Whittier St., Juneau, AK 99801. A complete application packet must be received by January 15 of the award year. The recipient is announced at the annual spring AkLA conference. Are you passionate about improving library service for students in Alaska? Have you worked in a school library? the benefit of students and teachers alike? Are you a digitally savvy librarian, excited about history, interested in computer programming and Big Data? Is it a high priority for you to continually and independently develop your professional skills and knowledge? Are you a self-starter who thrives in a collegial atmosphere? Do you love organization and details, as well as innovation and new ideas? We need you to assist with Alaska’s Digital Newspaper project at the Department of Education & Early Development (DEED), Division of Libraries, Archives & Museums! In 2016, the Alaska State Library became a participant in the joint National Endowment for the Humanities, Library of Congress National Digital Newspaper Program (NDNP). We are preserving and making accessible historically significant Alaska newspapers via the national portal and searchable database, Chronicling America. During the 2016-2018 award period, we expect to complete digital production of 100,000 pages of Alaska newspapers, to be uploaded by Library of Congress. There is room for you to learn and grow in this job, and to add your own flair and skills to our outreach campaign, and all other aspects of the project! The position is long-term, non-permanent with benefits. The project is scheduled to last through August 31, 2018, with a possible extension of the grant. Win a $1500 grant to attend a library conference! All early career (first five years) academic and research librarians and ML(I)S students in the US and Canada are eligible to apply. Applicants must complete a brief questionnaire, upload a CV, and submit a short video about what you have learned working in a library that you might not have learned in library school. What advice would you pass on to other early career librarians? Feel free to be creative with your video! Short on time? A video chat-style cell phone video is fine. Camera-shy? Say it with stop-motion animation. Feeling extra creative? Captioned interpretive dance will be accepted, too. The only constraints you have are time and video format– please keep your video under five minutes and MOV, MP4 (MPEG4), AVI, WMV, FLV, 3GP, WebM files are preferred. -What kind of librarian are you/are you interested in becoming? -What have you learned working in a library that you might not have learned in library school? -What advice would you pass on to other early career librarians? Applications are due by Friday, September 30. All winners will be selected by October 7, 2016.